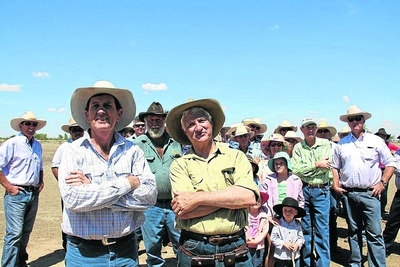 I see the mayor of Richmond, Queensland, John Wharton has called in local support, including that of his federal member Bob Katter in opposing Bankwest selling up Runnymede Station which has been in Wharton’s family for 96 years. The mayor claims Bankwest has indulged in corrupt practices. Whatever the rights and wrongs of the unfortunate case, it seems the property was leveraged with the bank for one reason or another, and risk is always attendant upon mortgages. The station’s name, “Runnymede”, conjures up memories of Magna Carta and freedom of the individual against (Bankwest’s?) arbitrary authority, but those who’ve ferreted a little deeper see Magna Carta as the Barons’ subterfuge for throwing off responsibilities relating to their lands, setting the British landholding system on course for repetitive boom and bust. Amongst other things, charts here and here suggest Magna Carta may have proved to be less of a success than the lords of the land were in gradually throwing off their land rents since 1215 (and putting taxes on us). I’m very pleased that the federal member for Kennedy saw fit to support his friend, John Wharton at Runnymede Station. I’d also be pleased if Bob Katter could hold fire on his down home chuckle and chatter and explain to people exactly where he stands on Australians capturing their mineral rents to the public purse, and whether he is behind the principle of property rates and land taxes. Seems he’s opposed to both. Yet, there it is, standing proud in the policy platform of his new party, Katter’s Australian Party – “Stop selling off State Assets”! Oh, I’m taking that the wrong way, Bob? We have no right to the annual rent of our most precious asset, the land – to the ‘super profits’ of our natural resources? Why not, pray tell? And I trust you’re going to support ALL Queenslanders who lose their home to the banks, Bob? There are lessons to be learnt here. Banks should NOT lend against bubble-inflated asset prices—for the sake of ALL Australians, including John Wharton—and capturing annual land and natural resource rents instead of taxes will not only stop bubbles from forming in the first place, but would see productivity replace property speculation as Australia’s national pastime. C’mon Bob, tell us who you’re really with: the people – or the 1%?